At the Aspinwall House grounds is an encircled glass structure where the patterns change every few minutes — with their brush, people are free to paint with water on the translucent surface. It vanishes in minutes, like much else that is impermanent, notes Beijing-based Song Dong. His installation, Writing Diary with Water is an older work that acquires new meaning in the context of the floods, where people participate in a shared act and play with water. attempting to give people in the state hope through a rainbow at Pepperhouse. In the lawns of the sea-facing heritage property is a metal frame that sprinkles water every few minutes and those who stand underneath can see the drizzle produce a temporary rainbow. “It is often considered a symbol of hope, and promise of better things to come,” says Longkumer, adding that we need to see beauty in the things around. He also projects it as a celebration of the recent striking down of Section 377 by the Supreme Court of India. Known for her participatory projects, where Monica Mayer often interacts with the viewers and seeks their opinion, in Kochi, the Mexican artist has brought her celebrated installation titled The Clothesline. She invites people to share their experiences of sexual assault, and also of trauma from the recent floods in Kerala. Hundreds have already responded to her question on an empty postcard: “What did the flood give you”. Some respondents share their grief — “I lost almost everything I had in my house”, “My wedding got cancelled by the floods and all my savings were in it” and “The burden of debt”. Others share hope for a better future and recall the good that people did — “Happiness is watching the youngsters in my locality working together and helping in putting things back together”, “Love and Compassion for others”. At the very space where during the last edition of the Biennale people were wading through knee-deep water in Chilean poet Raul Zurita’s Sea of Pain, this year the walk in the waters leads to Jun Nguyen-Hatsushiba’s Memorial Project Nha Trang, Vietnam: Towards the Complex — For the Courageous, the Curious and the Cowards. The video installation that comments on the perils of rapid modernisation acquire new meaning in the aftermath of the floods in Kochi, where the artist photographs fishermen pushing rickshaws underwater, coming to the surface intermittently to breathe. When the task begins to seem impossible, they swim to an underwater city with numerous mosquito nets — a tribute to the numerous boat people who drowned. The Australian aboriginal artist often critiques history through her work comprising found material. In her installation Distance is a Stage of Mind, she brings together the remains of the dreadful floods, from furniture to rocks and shells washed away by the waters. Inspired by the natural environment in Kerala, the work comments on “loss and renewal”. In his woodcut prints titled Urban Requiem: New World Climax, the Cameroon-born artist documents popular protests — including #MeToo and the Chengara Land Struggle. Another set of work titled Head Above Water emerged from his interaction with the people in the state. He asks school children to write about their memories of the recent floods in Kerala on postcards. 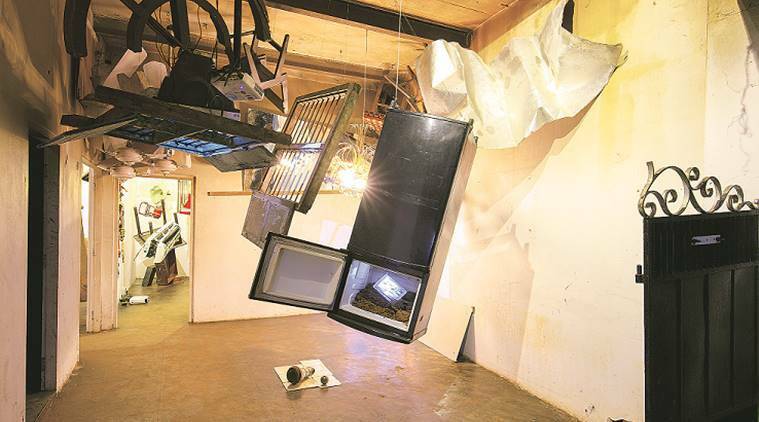 If Joel Varghese Thomas tells the artist “our crops were destroyed”, Anand Raju shares, “My aunt’s house drowned and she had to move to the relief camp”. The artist points out how like several other natural disasters, the floods too might have been caused due to human follies and unchecked construction. He calls his huge rubber tire Mr Sun, symbolic of the machinery used for construction. It also mourns the death of several farmers who committed suicide in 2015 in Wayanad by hanging themselves from rubber trees after the rubber prices crashed. Here are 5 tips to follow in order to get rid of eye strain at work.